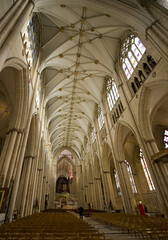 A truly historic event is due to take place in York Minster in just over a fortnight. By the kind permission of the Dean and Chapter of the Minster, there will be a Missa Cantata in the Extraordinary Form of the Roman rite at the High Altar of the cathedral church. The Mass will begin at 1:30pm on Saturday 26 March 2011. Music sung by the Rudgate Singers will include Byrd's Mass for Five Voices, Iustorum Animæ, Ave Verum Corpus, and Ave Regina Cælorum. Believed to be the first Catholic Mass at the High Altar since the reign of Queen Mary Tudor over 460 years ago, this will be followed by a procession to English Martyrs Catholic church (on Dalton Terrace). Benediction and Veneration of the relic of St Margaret will take place there at 4pm. En route, the procession will stop at the Shrine of St Margaret Clitherow in the Shambles.